As we rapidly approach the end of the year, let’s do a quick check-in to see how the various markets across the world performed during the most recent quarter. Despite some unsettling headlines—involving North Korea, hurricanes, and data hacks—world markets continued to post solid gains. In the past, we’ve gotten quite used to seeing U.S. stocks outperform those outside our borders, but we’ve seen a reversal of that trend for much of the year. 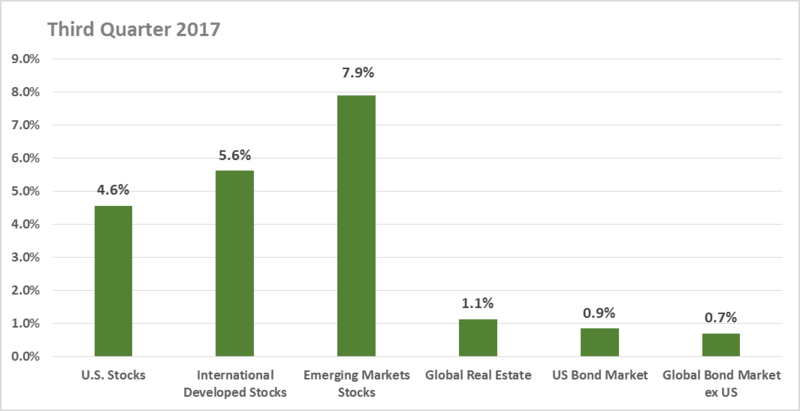 Both developed and emerging market stocks outside the U.S. posted higher gains during the quarter, while global real estate and bond markets managed to finish in the plus column as well. Given that the market never tells us what it’s going to do next, we believe it’s important to remain in a diversified portfolio, so you participate in gains when they occur but you’re not overly concentrated in any one type of investment. The Social Security Administration recently announced that it will use a 2% cost-of-living adjustment (COLA) for 2018. This follows a small 0.3% increase in 2017 and no adjustment in 2016. Retirees will finally be getting the pay raise they’ve been missing. Unfortunately, Medicare Part B premiums are expected to rise by almost the same amount, offsetting any extra cash retirees might see.